My formal training is in the field of chemical engineering where I earned my degrees over 40 years ago. I became seriously interested in pottery over 35 years ago with my first teacher being my art teacher spouse, Judy Hesselberth. For a period of several years I learned from Judy as well as by reading nearly everything I could put my hands on about pottery--the technology, the craft and the art--and by observation of numerous potters as I visited their studios. My training as a scientist and engineer also led me to experiment a lot on my own. I want people who buy my pottery to use it regularly. In order for that to happen my pots must be well designed and aesthetically pleasing to the eye and the hand. They must also show excellent craftsmanship. All of my attention is directed to achieving these characteristics. While I work with commercially prepared clay, I compound my own slips and glazes in order to achieve the effects I want. I currently fire stoneware clay in an oxidizing atmosphere at cone 6. I also have limited experience in reduction firing and salt glazing of stoneware and in raku. The decoration of my pots varies from simple to complex. Over the last few years I have been using geometric patterns as well as various surface textures combined with multiple slips and glazes to enhance my pottery. Most recently I have been exploring layering of multiple glazes combined with areas that are reserved for geometric designs. I have been greatly influenced by several potters and teachers with whom I have studied at the Arrowmont School of Arts and Crafts; however it is Mary Barringer who has had the most influence on me. While I have been doing a lot of hand building, I am now cycling back to more throwing or throwing and modifying. I work in my studio at home. 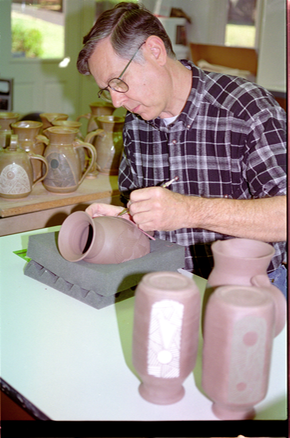 Now that I am retired from my first career, I consider pottery to be my current vocation with continuing growth in my skills and capabilities an unending challenge and opportunity. Along this line, I have achieved juried status as a member of the Pennsylvania Guild of Craftsmen. I also enjoy writing and have published a series of articles on various aspects of pottery craftsmanship. More recently, publication of the book "Mastering Cone 6 Glazes" with coauthor Ron Roy and commercialization of a glaze database and calculation software program I call GlazeMaster were accomplishments that gave me a great deal of satisfaction.